Start your mornings with something healthy AND delicious. 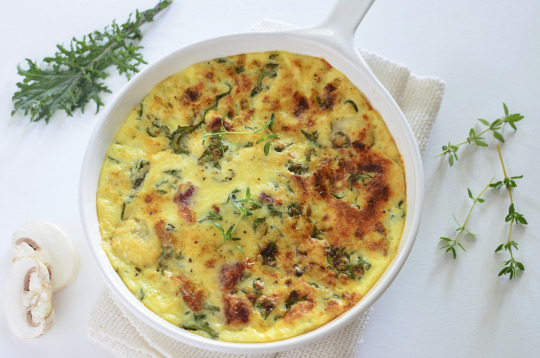 This frittata is filled with protein, fiber, and tons of vitamins thanks to our resident superfood, kale. Add tender baby bella mushrooms and some spicy pepper flakes, and you’ve got a restaurant-worthy beginning to your day. 1. Heat olive oil in a large, oven-proof sauté pan. Sauté the garlic and shallots for 3-4 minutes. Add the chopped kale and cook for 3-4 minutes. Add the mushrooms, and cook another 2 minutes. 2. Mix up the eggs with the milk in a small bowl. Add the spices. Pour the egg mixture into the kale mixture (in the pan) and let set. 3. Spoon in the goat cheese around the frittata. 4. Transfer the pan to the oven and broil for about 4-5 minutes, until completely set and the edges have browned a bit. 5. Slice into wedges and serve. February 27, 2018 by Corinne L.